The two frontrunners to succeed Chancellor Angela Merkel as Christian Democrat (CDU) leader pitched for the support of women in the party on Friday after polling showed that views of Germany's first female chancellor differed markedly by gender. Whoever wins the contest to succeed her at next month's party congress will be in pole position to become chancellor of Europe's economic powerhouse, and with surveys showing the two leading candidates neck-and-neck, every vote counts. 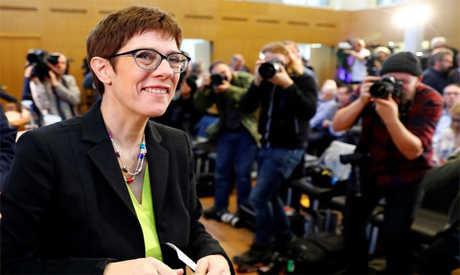 Annegret Kramp-Karrenbauer, the party's centrist general secretary and so widely seen as the continuity candidate that she is dubbed "mini-Merkel", was the favourite of 35 percent of CDU supporters polled for ZDF television. Also pitching to the party's Women's Union in Friday's hustings was Friedrich Merz, a businessman and lawyer who is returning to politics after 10 years in the private sector, most recently working for asset manager BlackRock in Germany. He had the backing of 33 percent, while Health Minister Jens Spahn was far behind on seven percent. The female vote could be decisive, with recent polls showing that most female voters would like Merkel to remain in office, while a majority of male voters would like to see the woman who has dominated European politics step down after 13 years. "We need more women in the party," said Kramp-Karrenbauer, reflecting that women made up barely a quarter of the party's membership - a factor that could count against her given polling that shows she is more popular than Merz among women. Merz, an economic liberal who enjoys the strong backing of Germany's still male-dominated business community, also implied that the party should do more to bring in women, holding up the equal opportunities legislation that binds private companies as a possible model. Whoever wins is expected to become the CDU's candidate for chancellor at the next national election in 2021. Merkel has said she plans to serve her fourth term in full, though there has been speculation this might be difficult if Merz or Spahn won. Both have said they would work with her. Both acknowledged they would have work to do restoring a once dominant and broad-based "people's party" that has been bruised by successive electoral setbacks. "The CDU should remain one of perhaps two people's parties in the republic," Merz said, insisting that the CDU needed to hold the political centre and recapture voters who had strayed to extremes like the far-right Alternative for Germany (AfD) party. The poll for ZDF, in which Mannheim-based Forschungsgruppe Wahlen questioned 1,200 people, said some 63 percent were happy with Merkel remaining as chancellor until 2021, while 34 percent were not.